The final day of the Tall Ships festival is underway at Penn's Landing and after Saturday's storms, visitors say they are ready to soak up the sun and set sail. PENN'S LANDING (WPVI) -- Thousands of people turned out for the final day of the Tall Ships festival at Penn's Landing featuring more than a dozen historic vessels. The fair-weather sailors who stayed home Saturday were out in full force on Sunday to check out the ships before they sail away. "We decided not to because of the rain. It was terrible," said Nancy Monteiro. Montiero and her 4-year-old son Gabe waited patiently to make their trip across the Delaware. "He wants to take the ferry and see the duck," said Monteiro. Mama Duck had a rough couple of days. First, the pontoon she rides on ripped, prompting emergency repairs. Then organizers say Saturday's wet, gusty weather sent her inside after only about 45 minutes. On Sunday, even with the sunshine, the wind was too strong and the 61-foot tall duck sat deflated. "Yesterday it wasn't inflated, so - the duck was sleeping," said Ian Rubin. 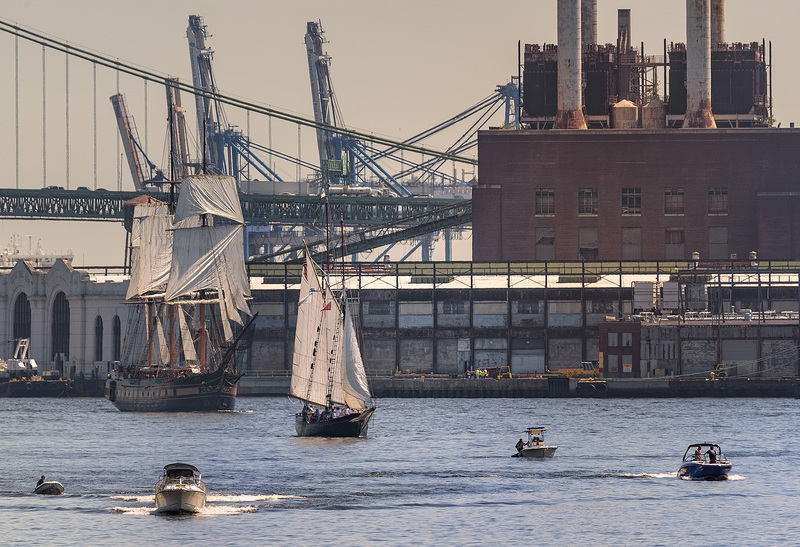 Images from the Tall Ships Parade of Sail at Penn's Landing and Camden Waterfront. But the ships still stood tall. Thousands of people climbed aboard the N.R.P. Sagres. Crew members said even in Saturday's rain, about 3,500 people toured the ship. "We are very proud of it. It's a national symbol of Portugal and the Portuguese military so we are very proud of her," said Midshipman Gose Mota. The Meyer Family came up from Cape May Courthouse to sail on the Delaware as a belated Father's Day celebration. "I just love the ships themselves - the history of them. And this is going to be my first time sailing on one," said Dave Meyer. The festival wraps up with fireworks which were postponed from Saturday because of the weather.